Colorado (14-9, 5-6 Pac-12) won its third consecutive game, while USC (13-11, 6-5) dropped its second straight and third in its last four games. The game was tied at 65-all with 1:49 to play, but the Trojans never scored again. Down by two with 19.4 seconds to play and coming out of a timeout, Derryck Thornton missed an open 3-pointer. Colorado shot 64 percent in the second half to hold off the Trojans. Evan Battey scored 14 points off the bench for the Buffaloes. D'Shawn Schwartz added 13 points and Lucas Siewert 12. Schwartz scored seven of Colorado's final 11 points. It was the first time this season USC lost consecutive games at home. Neither team could pull away in the first half, appropriately ending in a 29-29 tie. USC's biggest lead was five, Colorado's three. The Buffaloes managed only three assists in the opening half, but outrebounded the Trojans 21-17 led by guard Wright's six boards. 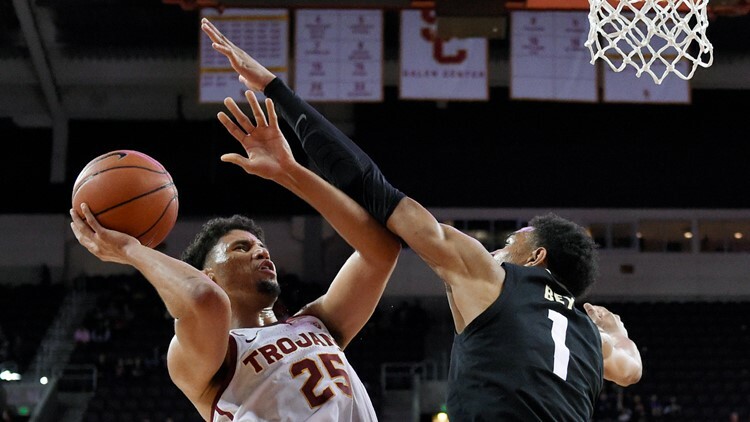 USC: The loss dropped the Trojans into fifth place in the Pac-12.